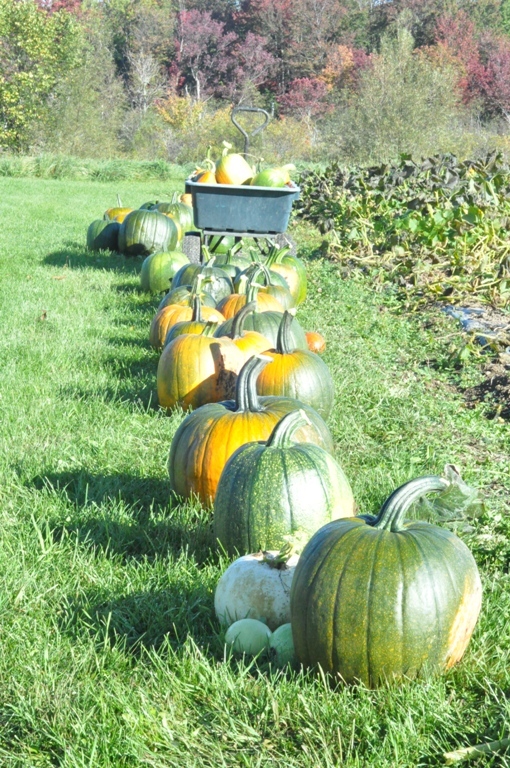 Remember a while back when I went over to my friend, Suzann’s garden to toil in the fields with her…do you recall all of the pumpkins we harvested? While, Suzann, has kindly given us several pumpkins, a variety of squash (lots of butternut squash) and it is up to us to put them up. When you have a glut of one kind of fruit or vegetable I think it is nice to find an assortment of different recipes and try making a number of different things. Pumpkins and squash really lend themselves to a number of interesting canning recipes and with the number of them I have I should be able to try them all. First, pumpkin chutney, Matt and I made this last year and we’ve really enjoyed it. 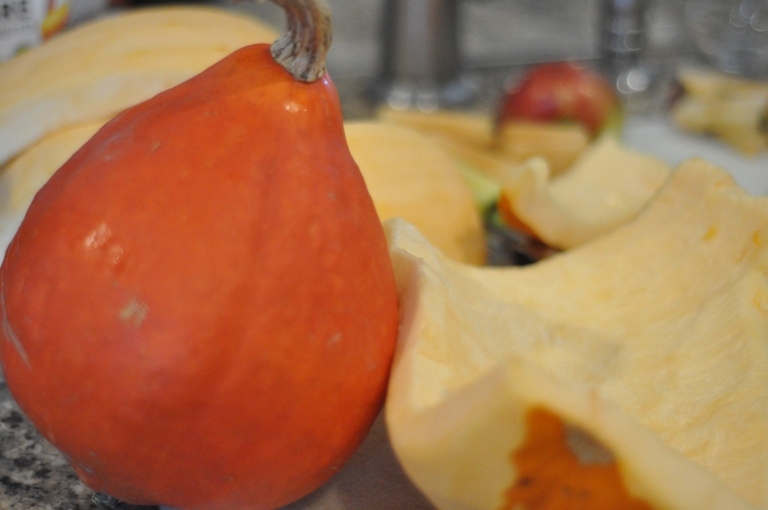 Pumpkins and squash have an array of different coloured flesh and no two seem quite the same. 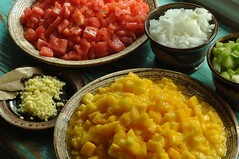 They also have a mild to sweet flavour which is perfect for the more savory side of chutney. 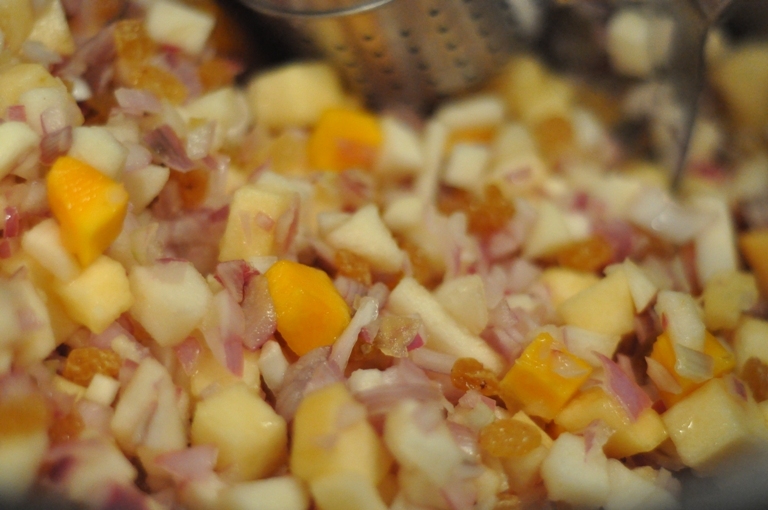 This recipe comes for Fruits of the Earth by Gloria Nichol. Place the dry spices and ginger root in a piece of muslin and tie it into a bag with string. Note: I like using a spice ball and my sister just gave me the most amazing one from William and Sonoma. The lid securely fastens and it floats. 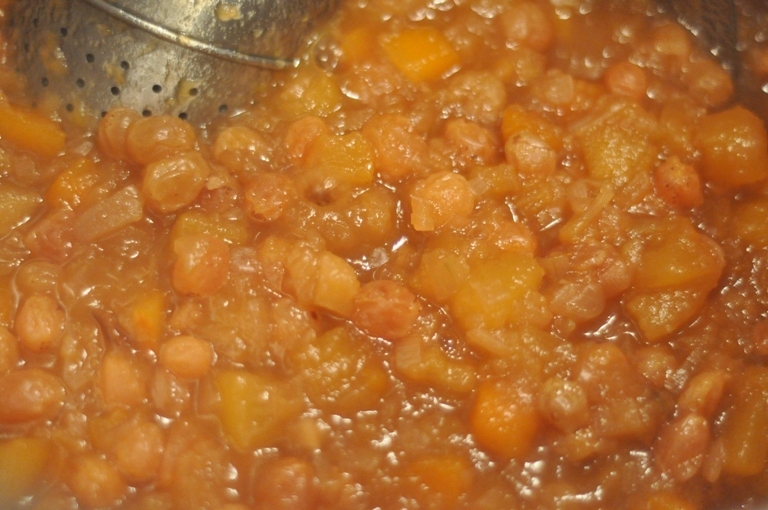 Place all the ingredients except the sugar in a stainless steel preserving pan and bring slowly to the boil, then simmer gently for 20 minutes until the pumpkin and apple are soft. 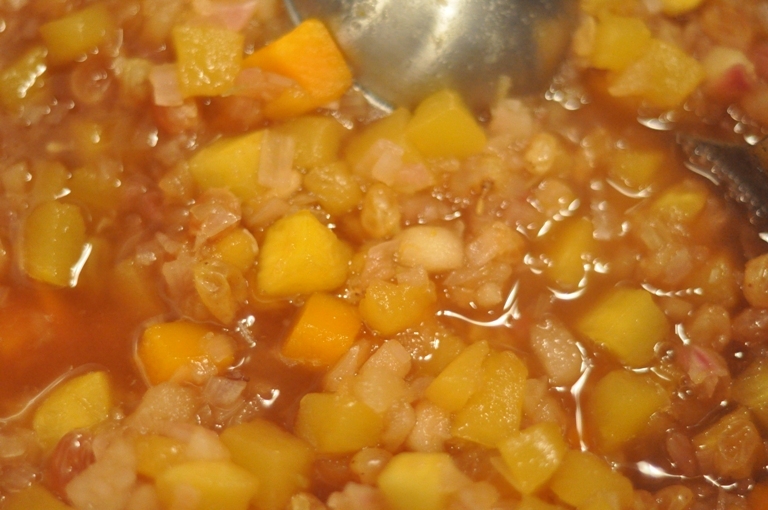 Add the warmed sugar and stir over a gentle heat until all the sugar has dissolved, then turn up the heat and simmer for approximately 1-1 1/2 hours until the chutney is thick but still juicy, stirring occasionally. 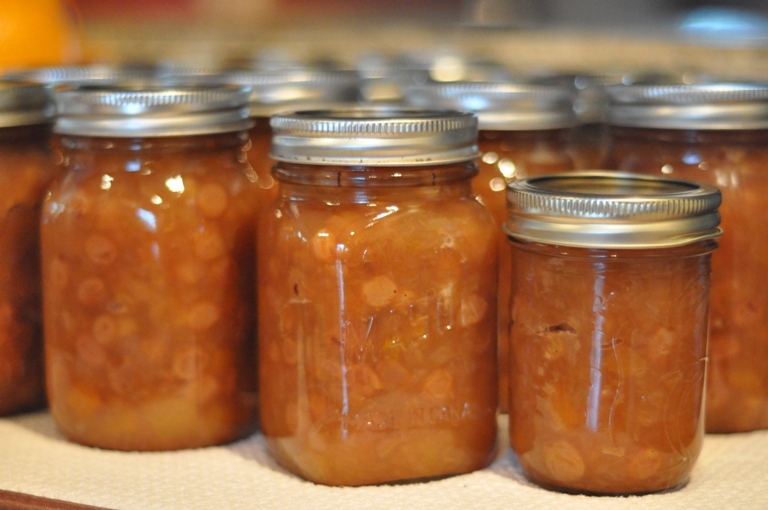 Remove the muslin bag or spice ball, then pour the chutney into hot, sterilized jars leaving 1/2″ headspace. Process in a hot water bath for 15 minutes. Turn off heat and remove lid. After 5 minutes remove jars from hot water bath, let cool, check seals, label, and store. Well, I’m tired. It’s been a busy day of making chutney while supervising my new labrador puppy, who is a very busy little guy. All the playing and foraging that he’s done in the kitchen with his two older brothers has also left him exhausted. 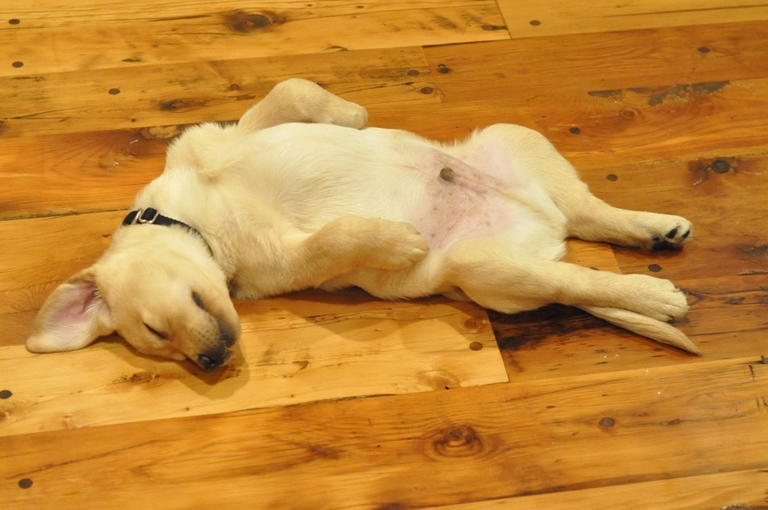 He’s already taking a nap…right in the middle of the kitchen floor. Looks like he’s going to be a natural in the kitchen. Oooh, this sounds so yummy. I have so many pumpkings, maybe I’ll make some of this. What do you eat it with? We use it as a side to any meat dish but I especially like it with pork.